Place flours, wheat germ, oats, baking powder, salt, baking powder, and cinnamon in a food process, go till combined. Whisk together honey, sugar, milk, eggs, oil in a large bowl. Stir in flour until well combined. Let stand 5 minutes. Cook um up and dig in! Mmm I love the oats in these. Will definitely give them a try; they look so fluffy and delicious!! I'll definitely try these this weekend! Do you know about how many the recipe makes? P.S. I featured your homemade nutella recipe on my last blog post! Hmmm I know the recipe will feed 4 VERY hungry adults easily. I think the recipe has you making tiny pancakes... whereas I made 8 LARGE pancakes! So tasty! OO I'll have to check out your post! Glad you made it! Hmmmm hard to say, I feel like the wheat germ helps hold things together. Maybe try flaxseed meal to get the same effect? 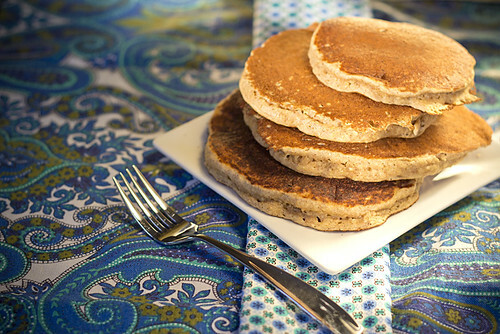 I just bought a bottle of the wheat germ and have been making these pancakes every weekend so it's worth it for me :) Good luck and let me know if you sub something else and how it works! oh yum--love the sound of these!